The temperature of the cone crusher’s internal bearings is monitored with a rugged data logger used with two external probes. The 'cone' style rock crusher is used extensively throughout the world in secondary, tertiary and quaternary applications within the aggregate industry. Typically, this size of machine will take a +1 inch -10 inch feed and make a minus 2 inch product at around 300 t per hour. Terex MPS (Materials Processing) in Coalville needed to log the temperature of the internal bearings of a new prototype machine. 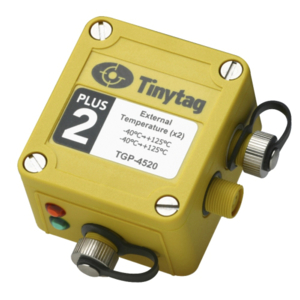 They chose a Tinytag Plus 2 rugged temperature logger used with two external thermistor probes. The data logger was placed within the machine and recorded oil temperatures in excess of 70° C. While in the machine, which was running at full speed on a test rig, the Tinytag experienced G forces of the order of 30g. Once stripped down, the download of the data was simple and easy and the Tinytag "was still in the rudest of health!" Terex are very happy with the logger and hope to see much use from it over the coming years.